Last weekend the Four for the Fourth Terry McGinnis Memorial Crit Series ran as an omnium to reward the most consistent riders throughout the four races. I got a late start* to the competition so decided to create a weekend omnium of my own. *Because mentally I wasn't ready to race crits. Last Wednesday there was a crash at the DMV crit that resulted in a fatality. Then, on Friday night in the Midvale crit, Sleevie crashed after winning, fracturing his elbow. I wasn't sure I'd race at all until Saturday when I watched the Lehi race, which was conducted on a safe, wide-open course where there were no incidents. Met up with Elden for a road ride around the Alpine Loop from the Sundance side, which I rarely ride. So, so nice, as it always is. Aaron, Adam, Chad, and I met up Saturday to ride mountain bikes on the trails near where I'd ridden my road bike the day before. The inevitable question is if you had to choose between riding mountain bikes and riding road bikes in American Fork canyon, which would you choose? Thankfully, no such choice has to be made, and we can do both. Great race on a great course. Steve took third behind Dave Harward and Evan Hyde. He rode strong all night. Fun to watch, enough so to remind me how much I love racing crits. Sunday was ridiculously hot. Which is great for me--I ride well in the heat. Given my lack of confidence, I opted to race Masters. Still feeling a bit skittish about being in the midst of a group and wanting the race to be as hard as possible in hopes that a few contenders would expire in the heat, I hit it hard from the gun and went off the front for three laps. Once I got caught, there were several counterattacks. Of course the one that I wasn't able to cover was the one that stuck. The chase was pretty much just Dirk Cowley (FFKR) and me. We rode hard--hard enough that the break was whittled down from five to four to two, but not hard enough to catch the two. With two to go, Jess (RMCC) went to the front, then on the last lap, Norm Frye (Ski Utah) took a flyer. I held Norm's wheel, which provided the perfect leadout, and was able to come around him to win the bunch sprint and third overall. First podium of the year, and I won a prime lap besides, so I was pretty happy with the race. If you can ski on the 4th of July, you should. There's still a lot of snow up there, so we did. Looking down on our objective. But before skiing, we had some donuts to eat. With as good as I felt Sunday and as much as I like this course, I had high hopes for the Holladay Criterium. The Ski Utah team, however, also noticed that I was feeling good. Every time a break went up the road, I chased onto it. Every time I got on, they chased me down, even though they had a guy up each time. Coming into the last lap, Jess had taken a flyer off the front. Even though we're not teammates, Jess is my friend, so I wasn't willing to chase. 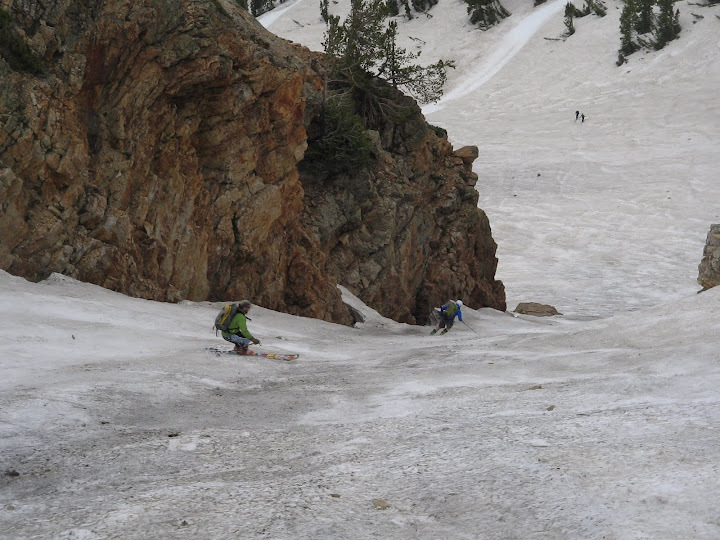 I sat in while Ski Utah chased, and that little recovery meant my legs felt great. I got on Rich Vroom's wheel, because I knew he'd go on the hill and try to get a gap. I figured I could follow him and come around at the end. The problem is that we were racing in the rain. And when crosswalk paint gets wet, it gets slick. And even though we'd been racing on the slick surface for nearly an hour, a certain racer somehow forgot it was slick, was too light on his rear wheel, and went down in the first corner of the last lap, taking Rich with him. I was behind the two with nowhere to go and went down, along with Cam from Ski Utah. I have never been more confident I could win a race, and instead I came home with a scraped elbow and knee and some chewed up bar tape. Winning two primes took out some of the sting, but I'm still bummed about the result. Justin and Steve took third and fourth in the P/1/2/3 race, so that was some redemption. And my result notwithstanding, the city of Holladay deserves a huge shout out for putting on a fantastic event. There was a fatality at the DMV crit? Chris, a rider crashed and was taken to the hospital. He passed away the following Friday.